Beef farmers in Brazil are today already using IoT, artificial intelligence and cloud storage in cattle rearing. Back in June 2017, Bosch introduced its Precision Livestock Farming system to the Brazilian market. It aims to make beef production more efficient – in a country that has more cattle than inhabitants. But what concrete benefits does the system offer? Gustavo Ferro, Director of the Livestock Business Unit at Bosch Latin America, and Ricardo Keigo Andrade, Team Leader of Livestock Software Development at Bosch Latin America, answer five key questions. How does the Precision Livestock Farming system work? According to the USDA Foreign Agricultural Service, Brazil has over 220 million beef cattle, one of the largest herds of any country. By comparison, the U.S. has only half as much livestock, but produces more beef every year. Technology can help reduce this productivity gap. Ferro: In simple terms, the Precision Livestock Farming system is an automated weighing station. The farmer sets it up in the middle of the feedlot, with feed on one side and water on the other. Whenever an animal moves from the feed to the water trough, or vice versa, it passes over the weighing platform. Cattle are not driven in any way. They move freely, as they like. Farmers can also set up the system in open pasture. Whenever an animal walks over the weighing platform, sensors determine its weight. This information goes to the “Field Box”, a processing unit located in the field. Data is then sent via antenna to the “Farm Box” in the farm office. This processes the information and communicates with the cloud, thereby converting raw data from the field into performance indicators. Each animal carries a UHF-RFID chip to identify it. Andrade: The system is in effect more than a weighing machine. What matters to us is the smart technology involved in monitoring the animals’ weight. The system also tells the farmer how many animals are on the pasture. And each animal’s weight tells him whether it is healthy or not. In fact, he knows this as soon as the system tells him that an animal is not crossing so frequently to drink. 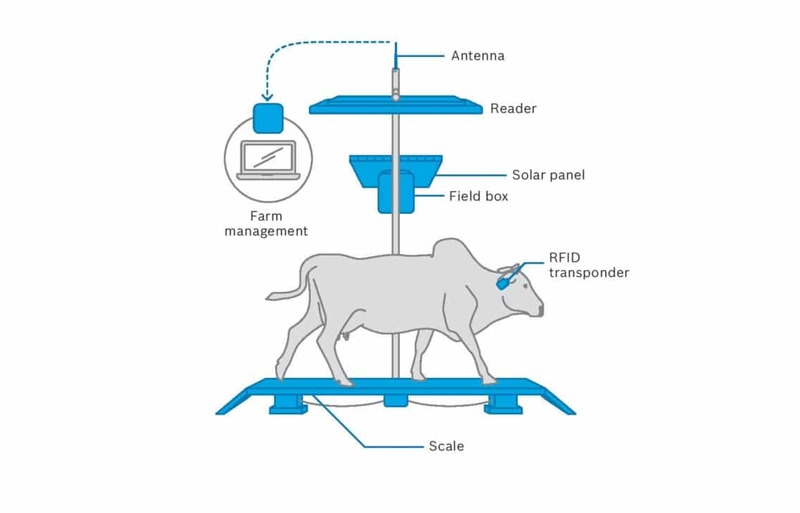 When the animal walks onto the weighing platform of the Precision Livestock Farming System, sensors measure its weight. 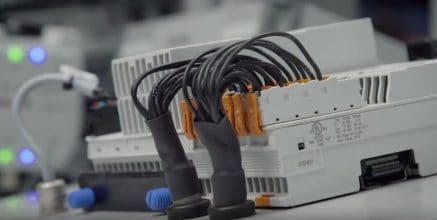 This information is transmitted to the "Field Box", a field processing unit that takes all the signals from the various sensors and converts them into accurate information for the Bosch system. The "Bosch Integrated Reader" identifies the animal by UHF radio frequency. All of this information is sent to the "Farm Box" via an external antenna. The local server and the "Farm Box" are located in the farm's office. The box processes all the data and communicates with the cloud, where the system’s intelligence is located. Solar panels allow the system to be operated independently of the electricity grid. What are the advantages of the Precision Livestock Farming system? Ferro: For beef farmers, it’s difficult to control and keep track of large herds. This system aims to replace subjective impressions with objective data based on facts and figures. And it provides more than just information on how much weight each animal has gained. Farmers also need to know whether the animal is healthy. Poor appetite is a symptom of many ailments. Constant monitoring of each animal enables the farmer to spot diseases early on and successfully treat them. How was the Precision Livestock Farming system developed? I've been working for Bosch since 2004. I enjoy being challenged; it's something that drives me. 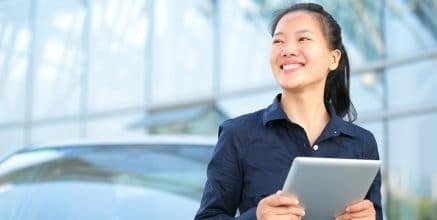 I've had the opportunity to spend ten years abroad, mainly in Germany and China, where I've worked for a total of three divisions. 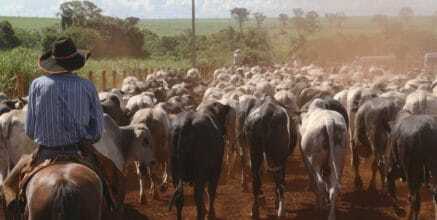 Livestock farming is in my blood. Without doubt, this is the biggest challenge of my career so far. It's a special project, facing special hurdles, with a special team. Together, we're opening up a new and significant market for the company that will also contribute to sustainability. Ferro: We took a very agile approach and did a lot of design thinking. At the beginning, there was only the idea, without any precise specification about how to implement it. We therefore moved forward on a step-by-step basis, with different prototypes. The whole system was developed through a responsive approach, based on user-centric design. We got the farmers involved at an early stage, to incorporate their needs. We put our ideas down on paper. Then we discussed with them what the final system might look like. That made the whole development process faster and more efficient. The response to the system has been very positive, especially regarding the software behind it. It was also important to ensure that the system was designed for field conditions. The weighing platform has to handle the constant load of the animals walking over it. And it must continue to deliver reliable readings when conditions get tough – when it’s very muddy or dusty, for example. Is it easy to implement the Precision Livestock Farming system? Ferro: The system is designed to be easily integrated in farm operations. Farmers shouldn’t have to radically reorganize how they work to use it. And animals shouldn’t be disturbed in their natural surroundings. I am a passionate software developer with more than a decade of experience in project implementation. Most of this work has been at Bosch, in both Germany and Brazil. My current challenges involve implementing Scrum in new business areas, combining software, hardware and business development. I have used Scrum to successfully implement innovative products and influence many areas in my organization. Andrade: There are problems with wireless communications in Brazil’s farming industry. Network coverage with either 2G or 3G is not good. So we created our own mesh network for the system. Ferro: It’s actually the system hardware that creates the network to transfer the data. Large farms in Brazil only have internet access in the office. Our system overcomes this problem with its own network technology and can be used anywhere. Andrade: Another problem is power supply, which we solved with solar panels. Our plug-and-play Precision Livestock Farming system doesn’t require any external power supply. 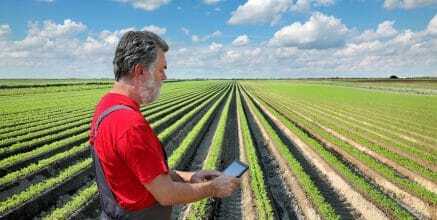 The farmer simply switches it on and has access to all the data recorded by the system. There’s no configuration required. The farmer can start monitoring his cattle right away. What does the future hold for this solution? Ferro: We plan to add further functions to the system. This includes a module which marks animals with a dye as they pass through. Farmers will be able to activate this function directly in the Precision Livestock Farming system. The idea is to keep a close eye on marked animals that aren’t gaining weight according to plan. The system could also be used in other countries. In fact, we’re already looking at Argentina, where beef farming is also a major industry. 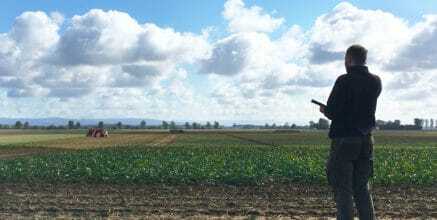 In October 2017, The Yield, a Bosch Australia customer, launched Sensing+™ for Agriculture, a tailormade solution for irrigated crops. Ros Harvey of The Yield knows how to turn IoT in agriculture from hype to reality. 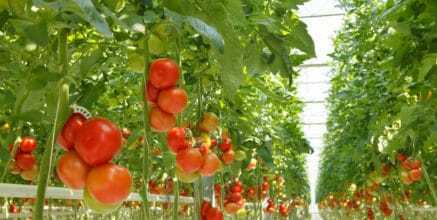 How do we sustainably produce healthy food in the future? 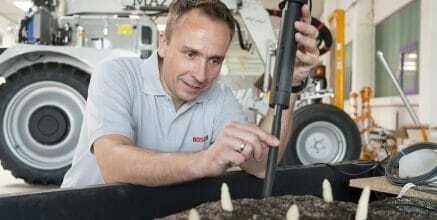 This is a question Bosch’s corporate startup Deepfield Robotics aims to answer. Do you want to learn even more about the Precision Livestock Farming system? We have the right story for you. I really do not know what is precision livestock farming before I read this blog. After reading this, I feel like why should I not start a precision livestock farming. Such an excellent and clear article !